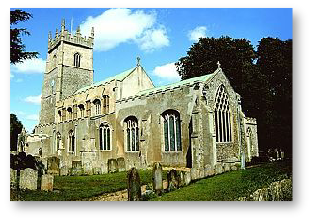 St Andrew's church is located in the heart of the village of Northwold on the High Street. St Andrew's is usually open daily during daylight hours. Sunday's at 11am we usually celebrate the Eucharist together, with an 8am Eucharist once a month. See our worship section for further details. Worship: Services are taken from the Church of England's Common Worship Order One in traditional language. On Sunday's we usually celebrate the Eucharist together. Hymns are usually accompanied by the organ and the Thorne Setting is sometimes used to sing the Gloria, Santcus & Benedictus and Agnus Dei. The Eucharistic prayer is usually said, rather than sung. Churchmanship is central to modern catholic with the Priests wearing Eucharistic vestments. Liturgy - past and present: In 2010, the Rector decided that it was time for the liturgical ‘resurrection’ of the Easter Sepulchre. On Good Friday evening, a simple ceremony of the Burial of the Cross, a modern adaptation of the medieval Sarum rite was introduced, followed by Compline and readings. At the Easter Vigil, the Gospel is proclaimed from the ‘empty tomb’ before the altar linens from the Sepulchre are placed on the altar as we prepare to meet our Risen Lord in the Sacrament of the Altar. An old tradition has been given a modern liturgical twist which adds greatly to the symbolism and liturgical drama of the Easter Triduum. Music: Our Churchwarden, Mrs Carol Sharp, currently plays the organ for services. Carol also leads a small community choir which sings at special occasions. If you'd like to find out more information or get involved, please contact Carol Sharp. Bells: There is a peal of eight bells at St Andrew's which are change rung every Sunday and for other special services, available at weddings by request. The bell ringers meet on Thursday evenings to practice. Please contact the tower captian, Steven Eyles for more information or if you'd like to try your hand at ringing. Church and School: The link between St Andrew’s, the Norman School and the community was highlighted during Advent 2010 when a Posada was inaugurated at the school and followed through in the community after term ended. Christmas Eve saw an enthusiastic group of students, teachers, parents, grandparents, friends and local community gathered outside the school gates, despite the bitter weather for a procession to St Andrews to welcome Mary, Joseph and ‘Donkey’ into their stable. This tradition continues and we now gather outside The Crown Pub in Northwold to knock and ask if there is any room at the Inn, before processing to St Andrew's for the remainder of the service. The service which followed was student led – brilliant – and mince pies, mulled wine and other goodies were enjoyed afterwards. The Benefice celebrates Pentecost every year with the school community in an engaging all-age Eucharist. The Rector also regularly leads collective worship at the school. Old Agricultural traditions: Plough Monday is enthusiastically celebrated in Northwold with a procession from the ‘Crown’ to the church where the plough is blessed and the sacred meshes with the secular with morris dancing and a mummers play to be enjoyed before the plough is processed around the village. We hope to extend this ‘mesh’ of sacred and secular tradition with a blessing of crops and maybe livestock…bulls and mad cows excepted…at Rogation, as well as continuing to celebrate Harvest in the traditional manner. And we may add Lammas to the cycle! History: St Andrew's was built around 1229, an impressive, partially flint-faced grade one listed building with the remains of a 14th C wall painting. It stands in the centre of Northwold, on one of the two parallel roads through the village. Situated in the heart of the village the church is central to the community, where not only religious, but many other events, take place. The only Grade I listed building in the village, it has stood for around 800 years ànd is noted for its beautiful chalk Easter Sepulchre. It is mentioned in the Domesday Book as Nortwalde, part of the Hundred of Grimshoe. There is a medieval chalice owned by St Andrew's which is curated by the Fitzwilliam Museum in Cambridge. For more information about the Easter Sepulchre and to read about the fascinating history of St Andrew's Church, please see the Church Guide. Churchyard: It has a closed churchyard with a section for the interment of ashes and the gravestones have been realigned into rows. There is a municipal graveyard in the village which continues to be open for burials.